To create a serigraph, the printmaker separates all of the colors in the image. These color separations are then photographically burned onto four silk screens (stencils). The silk screens are lined up (or registered) together on the press. Each color is then hand printed one color at a time, layering the colors to create the final serigraph. 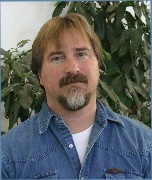 Wes Beyer moved to Truckee, California in 1978. Always interested in the outdoors, art and music, Wes has fused his knowledge as a graphic artist with his love of nature and local subject matter to create hand printed fine art in the medium of serigraphs.